BROWNTAIL MOTHS IN Augusta, West Gardiner & Waterville, ME or within a 60 mile radius. 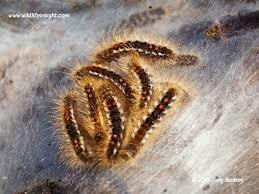 ​The browntail moth larva has prickly hairs covering its body. It has two broken white lines on each side of its brown body and two orangy-red spots on the end of its back. These dots are one behind the other. The caterpillars grow to about 1.5" and mature in late June or early July. ​In late August the larvae emerge and form overwintering webs in trees and shrubs. The nests are silvery white, 2 to 4 inches long, and are found at the tips of branches rather than in the crotches of the tree branches. They glisten in the sun. The nests are much smaller than tent caterpillar nests. There are 200 to 300 larvae in each nest. 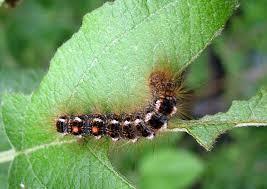 The browntail moth population has intensified which may mean more people are at risk of exposure to the larvae hairs. The area primarily affected by this insect includes parts of Bath, West Bath, Brunswick, Topsham and Bowdoinham; other affected towns include Augusta, Falmouth, Freeport, Kennebunkport, Lewiston, Lisbon Falls, Turner, and Wiscassett. Most people developing the rash will do so within hours of outdoor activity. 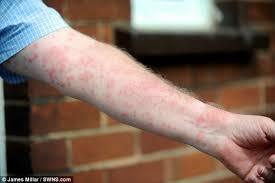 The duration of the rash varies, from hours to days.